This blog post have been requested to be done for so long, and I am sorry it's taken me so long to write it and get around to putting it up on my blog. Thank you to everyone who did contact me asking me to do this blog post for taking the time to do so. 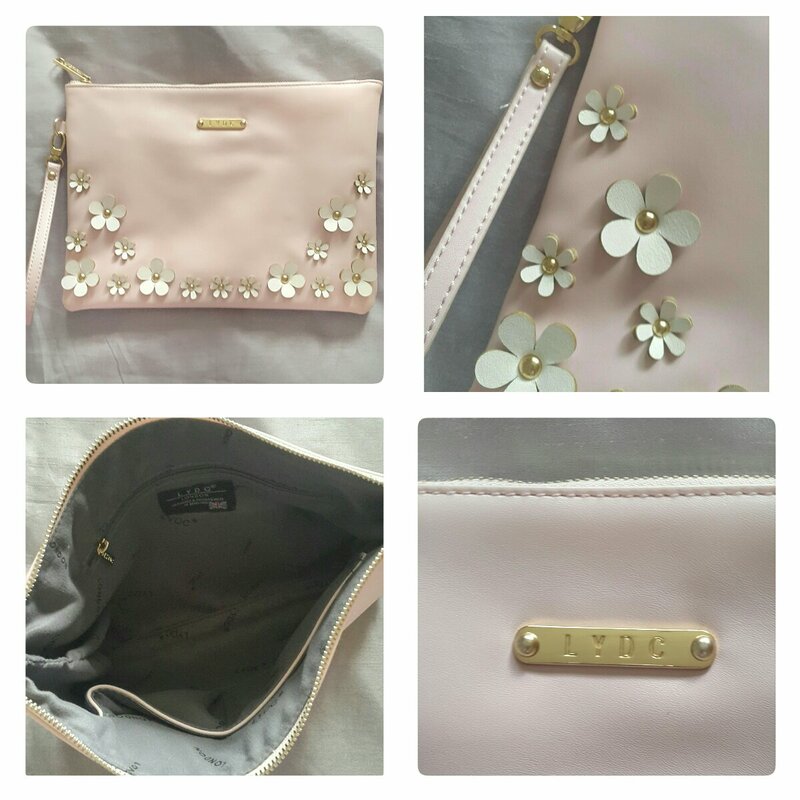 I bought this beautiful pale pink coloured LYDC Daisy clutch bag from one of my favourite stores, All That Glam for only £15.00. Although All That Glam is based in Prescot they ship world wide for such low prices. 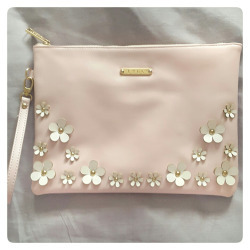 The bag has a wrist strap, it is fully lined and has 3D daisy flowers on the front of it. You can follow All That Glam and check them out via these links: All That Glam Website | All That Glam Facebok | All That Glam Twitter. You can also buy this bag online at SSE Fashion House by clicking here. 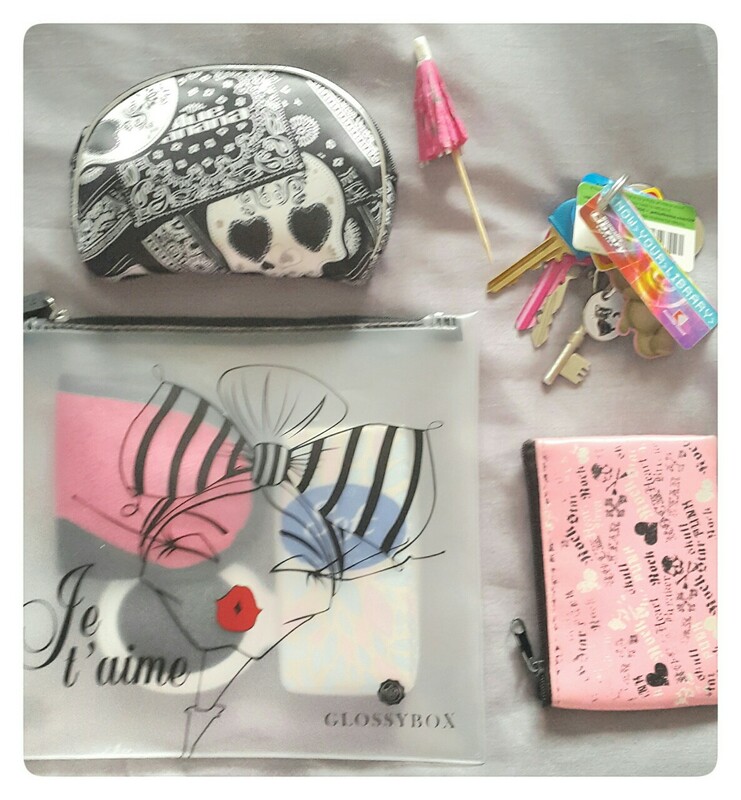 I always have smaller bags in my clutch bag to make sur everything is in order and nothing gets messy. It really does help a lot, especially if I am in a rush so I would recommend doing this for people who want to organise their bags more. 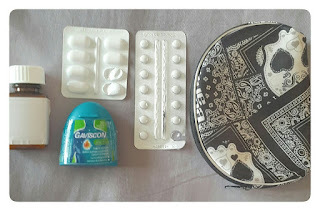 Inside my bag there is two pockets, in the little one I keep my mobile phone and inside the big one I keep women's 'time of the month' things. I also have my keys in my bag, a little fake umbrella which I got in a mocktail from a meal at The Chinese Buffet (you can see the review on my time at The Chinese buffet by clicking here) a couple of weeks ago. Other things I keep in my bag which I forgot to take pictures of are; a small notepad and pen, a mobile portable battery pack, my mobile phone (which I am using to take pictures), and I try to keep an umbrella handy as well. I got this bag from a Glossy Box subscription box and I really love it. Inside this bag I keep; a compact mirror and fold up brush, a packet of tissues, an eye mask, mini perfumes, hand sanitiser, and whatever lip product I am wearing that day. My little skull purse is so cute, I have had it for years and I think I bought it from Claire's Accessories SO many years ago. 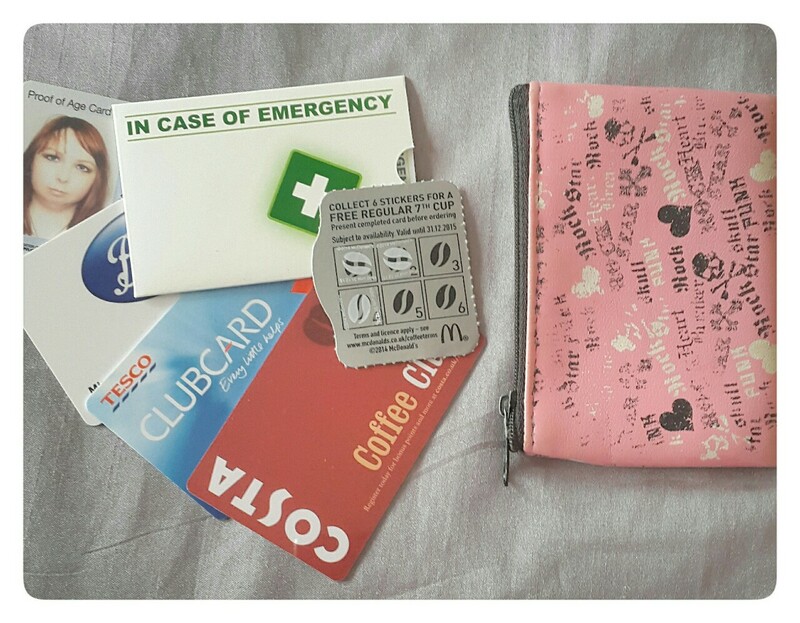 In this little purse I keep all of my cards, I only put a couple in the picture for safety reasons. The cards I keep in my purse are; my bank cards, my ID, my in case of emergency card, my boots card, my superdrug card, my Chanel card, my pets at home card, my yankee candles card, my toys 'r' us card, my All That Glam store card, my tesco club card, my asda card, my costa coffee club card, and my McDonalds drinks token. 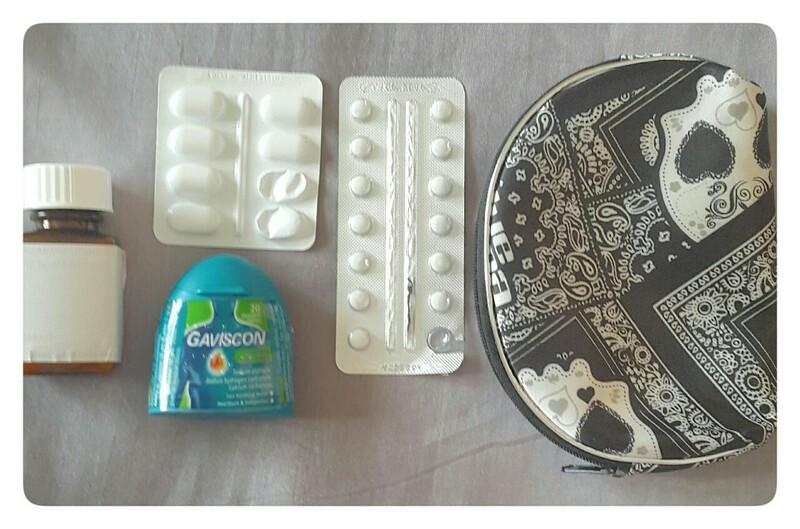 Because of medical reasons I like to keep my medication handy always so inside of the black skull purse in my bag I keep; my everyday prescription tables, a tray of buscopan, a tray of paracetamol, and some gaviscon as I get really bad heart burn and acid reflux. That is it, that is everything I keep in my bag. 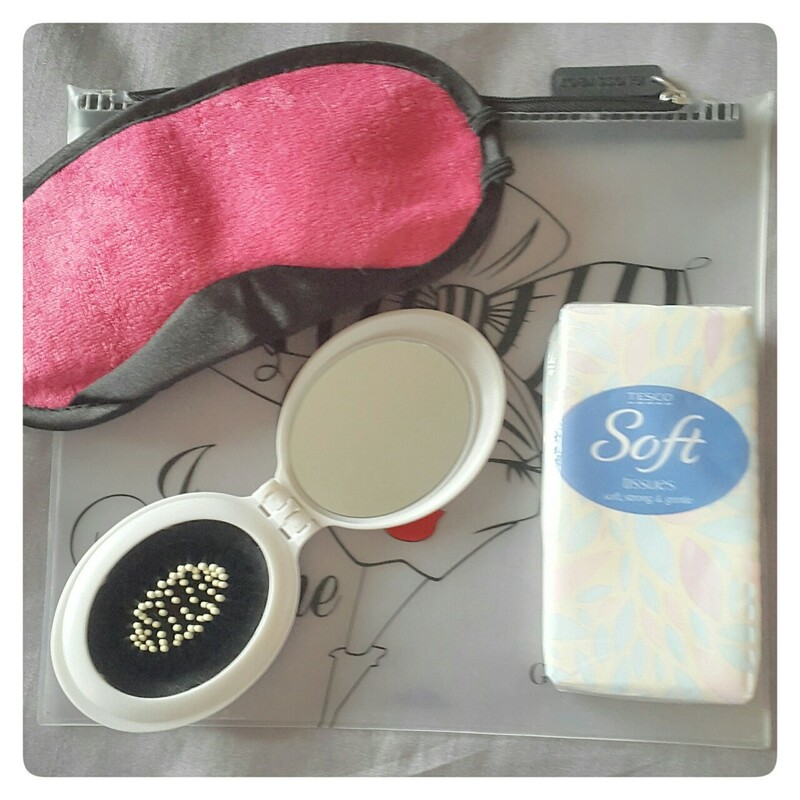 I really hope you all loved this blog post, I know it's been a long wait for it. If you have a blog post like this one, let me know as I would love to read them all. I hope you all have a wonderful day beautiful's!